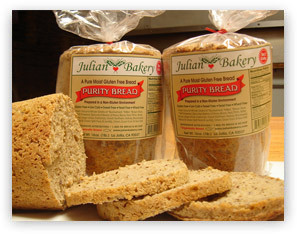 Julian Bakery is a company that sells healthy and delicious breads. The breads that I was sent are all amazing. I was sent the amazing sourdough, cinnamon raisin smart carb, and the low carb smart carb bread. My favorite is definitely the amazing sourdough. Upon receiving it, I had two slices toasted with a little butter. The bread is dense, chewy, and tasty. I also had an open faced vegetarian philly steak sandwich with it for dinner which was great too. This bread that 60 calories per slice, 5 grams of protein, and 6 grams of fiber per slice. The ingredients used are only good ones too! I also really like the smart carb cinnamon raisin. That is a protein packed piece of bread. Each piece has 137 calories, 13 grams of fiber and 14 grams of protein! I may have to say that this might be some of the best tasting bread that I have ever had and the amazing nutritional stats make it even better. Whenever I have had low carb breads in the past, they are often dry and taste like cardboard. This is not the case at all with these breads. You must try them! You will be amazed. The giveaway will be for 6 loaves of bread to two different readers. The giveaway is open until Midnight on Tuesday June 28th. Winner will be chosen on Wednesday June 29th using Random.org. The winner will have 48 hours to respond or a new winner will be chosen. Visit the Julian Bakery website and let me know which product that you want to try the most! -Tell me why you subscribe to my blog (ex: do you like the giveaways? the product reviews? recipes? etc.) (1 entry). I'd love to try the Amazing Sourdough! I love sourdough bread, but the good stuff is hard to find! I'm a new subscriber, but the reason I subscribed was because of the giveaways! I love entering giveaways! Entered your hot sauce giveaway. The amazing sourdough sounds good! I most want to try the Bean Bread! I follow your blog because I love reading about your recipes and you also have some great giveaways! I'll take your word and now I want to try the sourdough too! I would love to try The purity bread! I most want to try the Amazing Sourdough. I subscribe to your blog because I love the giveaways and the product reviews and the recommendations. I like Sourdough bread ! i would want to try the purity bread! My husband and I over the last 3 years have made a huge effort to eat better. I love that you do reviews (and giveaways!) of healthy lifestyle foods and products. I'd LOVE to try their sprouted Purity Bread-Gluten and dairy free!!!!! I entered your Buy Green Review and Giveaway! I LOVE giveaways! That's why I subscribe to your blog!!! I'd love to try their sourdough and their Smart Carb #1! Thanks! I WOULD LIKE TO TRY THE PURITY BREAD. NOT ONLY IS IT GLUTEN FREE, BUT HIGH IN PROTEIN- 6g PER SLICE. ALSO, BECAUSE THE BEAN INGREDIENTS ARE SPROUTED, THERE NO GASSY EFFECT FROM EATING THE BREAD!! I FOLLOW YOUR BLOG MAINLY FOR THE FOOD PRODUCT REVIEWS ESPECIALLY THE GLUTEN FREE ONES. I've been a follower for awhile because I like giveaways and I like to stay healthy by eating correctly. #2 I subscribe with e-mail! Purity Bread is the one i would like to try first. I want to try the Bean Bread Gluten Free Loaf! I subscribe to your blog for the product reviews, recipes (which I've tried many times), and the giveaways! Plus, I think it's neat that unlike many food bloggers, you actually have a degree in dietetics. I would try the sourdough bread. Thanks for the giveaway. I just think the purity bread sounds good :) all of them would be though! subscribed to your blog through google connect. Entered the bella viva giveaway! I have never tried low carb breads. After your review of them I am really interested in trying. My first choice would be Manna from Heaven. Of course, I'd have to mix it up with some of the others to taste test myself. With a prize of six loaves, you're giving me flexibility. The cinnamon raisin. That's my favorite as toast for breakfast! I'd like to try the Manna from Heaven bread the most though I sure would love to try them all :) Thanks! I subscribed to your blog because I love giveaways in general but more so would like to learn about healthy and nutritious products. Thanks! I wquld like to try the Sourdough bread. I am entered in your Bella Viva giveaway. I'm a big fan of sourdough. I think that's the one I would most like to try.